I can’t believe the holidays are already upon us but here they are and I can’t help but smile at all the wonderful scents to be had during this festive season. In my home, we can’t go through Christmas without burning at least FIVE different Christmas tree scents. Lol! My husband adores the classic and fresh scent whether it’s pine, balsam or fir… he loves it all so I of course aim to please!! Bijou is a luxury brand I’ve really enjoyed over the past year and a brand I always look forward to reviewing. Their candles are gorgeous and who doesn’t love something luxurious or the chance to be pampered? That’s what luxury candles signify to me… class, uniqueness and a cut above the rest. Anyway, you can read my Bijou candle reviews here if you’re interested. Now that they have a whole new candle line to explore… I couldn’t resist giving them another whirl. Bijou’s new line is available in seven different fragrances and each of the 7 scents have been named after actresses from the old Hollywood era. FUN!! 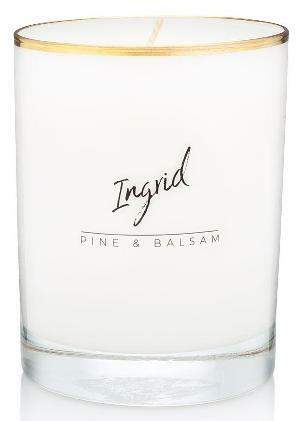 The scent I’ll be reviewing today… Ingrid and the scent itself… Pine & Balsam. I must tell you, the moment I opened the shipping box, the fresh scent of balsam wafted all around me. It was very strong, fresh and I knew my husband was going to love it!! But before I delve into the scent, let me first tell you a bit about the candle. The candle was gorgeous and housed in a thick and heavy white box that fit the candle snugly. The box had a simple label on the front that said Bijou, the scent name (Ingrid) below it along with the description of the fragrance directly below the scent name. The candle itself was white with beautiful 22-karat gold trim along the top edge and wrapped in black tissue paper. Yes, the trim is real gold and you can tell. The candle was simply gorgeous so very nice, simple and elegant presentation. See picture above for visual reference. Scent notes: Weekends at the cabin, a crackling fireplace, the first snowfall, watching Home Alone again. Very nice description! What did my nose pick up on the most when I opened the lid to the box? Fresh balsam and pine all the way. LOVED!! Hoping once the candle was burning, all those other yummy notes in the description would come to life as well. Crossing fingers!! And with that said… let’s find out! I decided to go bold and light this candle in my master bedroom. I had a feeling it would be a room filler and low and behold… it was!! Once the wick was lit, it took a good hour or so to reach a good size melt pool but the aroma was present long before that and it was fresh and heavenly. My entire bedroom smelled like a freshly cut Christmas tree. Up close, I’m pretty sure I did smell a touch of orange bitters and enderberry but they were both very subtle. Spearmint? I’m not too sure. To my nose, this fragrance was a lot more pine and balsam and it was wonderful and a perfect holiday Christmas scent just as it was. Loved it! Strength – I would rate this candle a 10 in any size room. Yes!! It was a room filler and it was spectacular. This candle burned pretty good. It did struggle to reach a full melt pool with each lighting so I did have to use my wick dipper to push leftover wax along the glass wall into the wax pool. Not a big deal but something I do like to point out when it happens. Other than that, perfect and clean burn. No sooting. I thoroughly enjoyed Ingrid, Pine & Balsam from Bijou and I almost forgot to say… so did my husband, my official pine and Christmas tree expert. ? He wasn’t too sure at first but once the scent was brewing throughout our bedroom, he absolutely loved it and said it smelled super fresh and very authentic. Yay!! An official husband approved Christmas tree scent. My first of the season! In closing, if you’re in the mood for a bit of pampering and are after a classic Christmas tree fragrance, give Ingrid a try. It was delightful and a candle I will for sure be burning again. Read more Bijou candle reviews here. 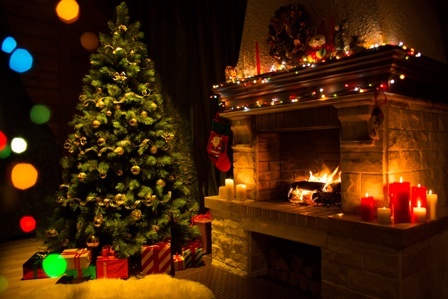 I am desperate to find a tree/spruce/balsam candle that has a little sweetness to it ,which at first may sound artificial sounding, but if you have ever been walking on a crisp winter evening, the scent(at least that I get) is the fresh authentic balsam, then a hint of sweet, almost warm sweet. A long time ago, I did find the scent, you would smell that distinctive, pine, but then, wait, what is that I smell? Could it be? A little sweet. Unfortunately, the manufacturer stopped making it, otherwise I would have bought it by the case. The closest one I found is tree trekk( is that bridge Water?). And I do buy by the case after Christmas sales events. However the pine/balsam/spruce is lacking in authenticity, so it’s an okay substitute for now. Thank you. I always appreciate your reviews, so thanks! How would this candle compare to the famed Thymes Fir? If you could only have one, which would you select? (tough choices!) Strength? Aroma? Second: Would the 2 complement each other? Tough call. I absolutely LOVE Frasier Fir from Thymes. This candle was very similar and would for sure compliment Frasier Fir. Both are equally as strong. I’d say definitely give Bijou’s version a try if you’re in the mood to try a new company. Thanks for your quick response. I went ahead and ordered the Bijou “Ingrid” and look forward to comparing it to Thymes Frasier Fir and Nest’s Birchwood Pine. Ooooh!! Nest’s Birchwood Pine is another great one. It sounds like you love the same type of scents I do so can’t wait to see what you think of this one. Please let me know. I still have it burning right now and am really loving it.